zijn wij gesloten in verband met vakantie. Amazing food and such lovely staff. A great friend invited me to a 5 course dinner at Jaimie van Heije. Every aspect of the meal was a 10 from the presentation of the foody, friendly service, and of course the actual food. A special shout out to our amazing server Janneke. I can't wait to come back the next time I am visiting Amsterdam. Really enjoyed the new menu. Staff, food and atmosphere were all excellent! Very nice restaurant. I visited with friends, and we happened to be the only late reservations for the night. Staff was very friendly and accommodating. A bit of a trek from the city center, but would definitely recommend to anyone visiting or living in Amsterdam. Amsterdam Center feel in a small village outside the city. 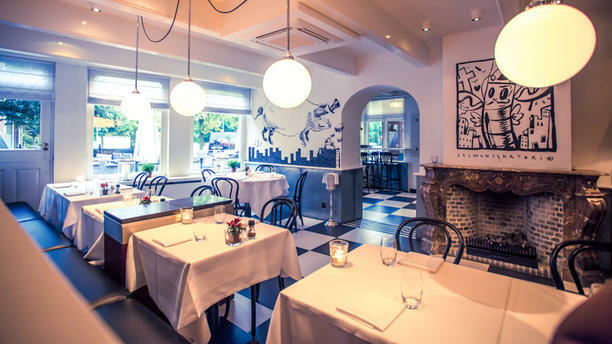 Ideal for dining in the Amstelveen area. Food quality was very good. Let's be honest....this isn't Paris....but a well priced (not cheap), upscale feel, with an inventive multi-course menu. Would definitely recommend (business or social) and would definitely return. Very pleasant experience, we will come back! We had a wonderful dinner in a very easy going atmosphere considered the Michelin character of the restaurant. The rear part of the restaurant was too noisy but seating was changed immediately to the front part and that felt much better. Food was excellent. The Bougogne wine che chosed was not yet on the peak of its taste and shouldn't be on the wine list of such a restaurant. Staff was friendly, well trained and educated. The inside decoration is a question of taste. I liked it because unsual and cool for a Gourmet restaurant. Nice guests tourists and locals. Good attention and pleasant atmosphere at Jaimie. The chef shows his dexterity with techniques, ingredients and he's surely got creativity. But dishes, though pleasant and sometimes quite well presented, sometimes failed to convince. Combinations of flavours need further honing and figuring out to really work. Foams and consistencies are still a bit botched together. I am sure that with time and patience these shortcomings will be overcome. PS: plates were in our opinion often mistaken! Eating into those bowls, no matter how "eastern" it might look, it's just unconvenient!! we were there on Wed's eve, restaurant was fully packed! I think they prepared very well for the Restaurant week, menu was supplied in English. Waiter was very friendly and explained us on every course. We didn't go for the extended version, but the standard 3 courses for Restaurant week. Main course was stake together with carrot and some other vegs, very cool design! What impressed me the most was the dessert, the cheese cake part came out as a Buddha face. I did like the idea but also found it can be offensive to anyone who's religious. Imagining if it's in the shape of Jesus, would a lot of people like it? so something to consider. Taste was good, some combination I found less attractive, but of course it's very personal. Went for the second time to this restaurant and loved it! The food is interesting, tasteful, beautifully presented, and the service couldn't be better. The wine selection made by Dennis was not only delicious, but his explanations were excellent. This is a restaurant that I will return to, many times!